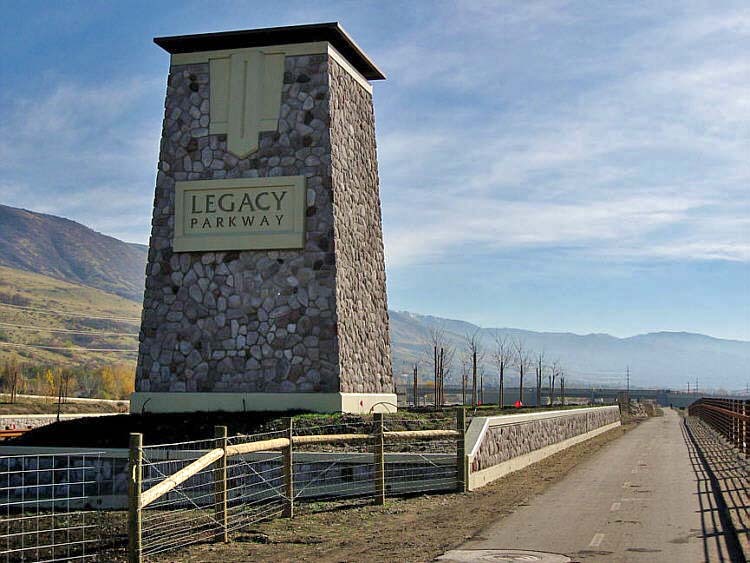 The Legacy Pathway trail runs 12.5 miles alongside the new Legacy Parkway. The north end of it begins on the west side of the FrontRunner tracks at the Farmington FrontRunner station parking lot. Look for the paved trail on the northeast side of the parking lot. It runs south along the west side of Legacy Highway, eventually crossing under the highway, and continues along the east side all the way to the Jordan River in Salt Lake City. The pavement did end after crossing below I-215, at the river, but it is now finished all the way through to 1700 North and Redwood Road, where the Jordan River Parkway begins. Legacy trail is fairly flat, but it rises and drops a few feet as well as zigzagging to break up the monotony. I have ridden this trail many times now, and being out in the open I like it best for winter riding. No shade, so the snow melts fast. One thing this trail lacks is restrooms. There are many trailheads along the way, but no restrooms. Last summer there was a port-a-potty about a mile from the south end, at Center Street. New information - In the fall of 2010, they paved half of the trail from the south end of Legacy along the Jordan River. This is called the 'Chevron Mile'. In November of 2011 the last mile was paved, but a boardwalk was in progress to cross some wetlands. In February of 2012 the boardwalk was finished and open. Also a new section has been paved at the north end of Legacy, from the Frontrunner Parking lot over to Burke Street. You can travel down Burke Street to the Rail Trail, or use Farmington Creek trail. See next paragraph. New information - Near the north end of Legacy, one can now ride a paved path over to the Rio Grande Rail Trail, by way of the Farmington Creek Trail. Where the trail goes under State Street in Farmington, take the trail on the south south side of the underpass west up to Tippetts Lane, and look for the Farmington Creek trail a little farther west. In seven tenths of a mile it connects with the Rail Trail that is now paved all the way to the north side of Roy City. See map of Legacy Trail to Rail Trail below. Update:The 3 mile section of the Rail Trail south of Farmington Creek is now paved. One can ride all the way through along the Rail Trail now. From the north side of Roy City to West Bountiful is 25 miles of paved trail.